When the weather becomes fall-like (as it did in Indiana this weekend), I love making an enormous pot of soup with enough leftovers to last a week. I made this bean soup from Thomas Keller’s Ad Hoc at Home starting with dried cranberry beans. Keller recommends seasoning it with red wine vinegar, but bottled hot sauce adds some nice heat. You could make this with canned beans without sacrificing much, but the ham hocks are an absolute must. Two days before you want soup to be ready – Put the beans in a large bowl, and cover with water. One day before you want the soup to be ready – Drain the beans. Put them into a slow cooker with the 2 leeks, 2 onion halves, 2 carrot halves, boquet garni, and 12 cups of water. Cover and turn cooker onto low for 6 hours, stirring every hour or so. When beans have cooked, remove from the liquid to a large bowl with a slotted spoon. Discard the vegetables and boquet garni. Strain the liquid over the beans. They can be refrigerated for 2 – 3 days. 1 hour, 40 minutes before you want the soup to be ready – Heat the canola in a huge stockpot or dutch oven over medium heat. Add the diced carrots, diced leeks, diced onions, garlic, and some salt. Stir to combine and coat vegetables with oil. Reduce heat to low and cover with a parchment lid. Cook very slowly, stirring occasionally, for 30 minutes or until vegetables are tender. Discard the parchment lid. 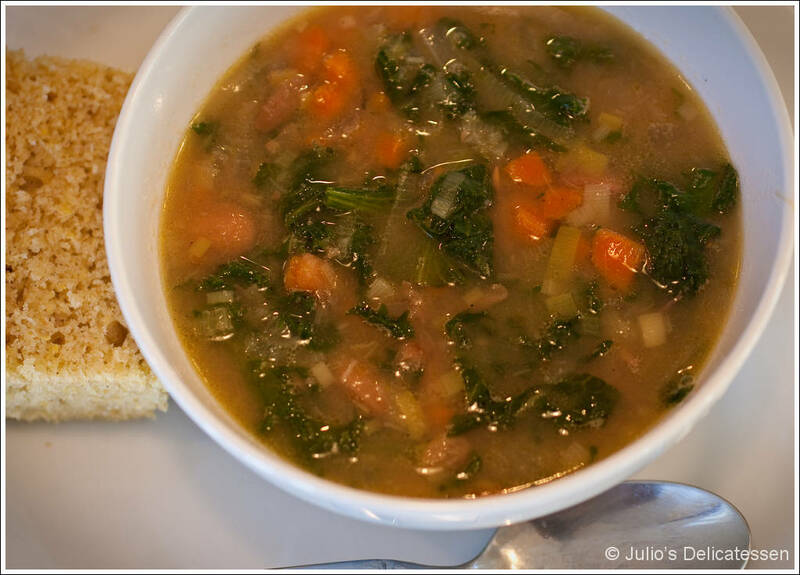 1 hour, 10 minutes before you want the soup to be ready – Add the ham hocks and chicken stock. Bring to a simmer, and simmer gently for about 1 hour. Turn off the heat and transfer the ham hocks to a plate. While the ham hocks are simmering in the chicken stock – bring a large pot of salted water to a boil. Cut the escarole into strips. Blanch for 30 seconds, then transfer to an ice bath. Remove from ice bath and squeeze dry. Place on paper towels until you’re ready to add it to the soup. When the ham hocks are cool enough to handle, remove the skin and fat. Shred the meat and return to the pot. 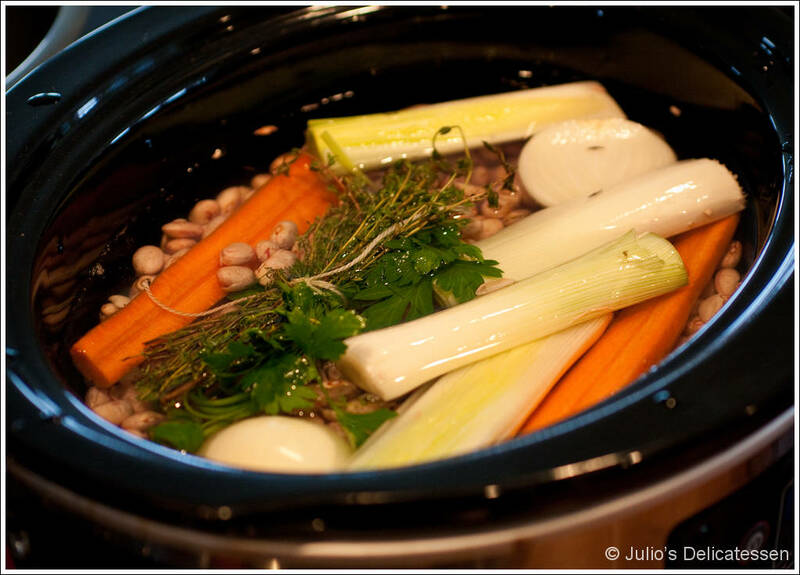 10 minutes before you want the soup to be ready – Drain the cooked beans and add the beans to the pot. Add the escarole to the pot. Season with salt, pepper, and red wine vinegar. Bring to a simmer and serve.